Enda Stevens would have no concerns about Jack Byrne if the Shamrock Rovers man was thrust on to the international stage against Gibraltar on Saturday. Byrne was called into Mick McCarthy's panel on Sunday after Callum O'Dowda was forced to withdraw with a knee injury. 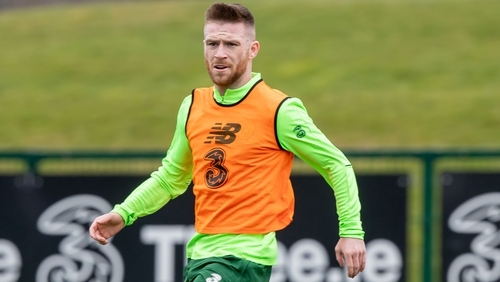 The Dubliner trained with Martin O'Neill's extended panel three years ago, confidently declaring: "Although I'm not in the squad, I believe in my own ability and that I'm as good as anybody in the squad". Then on loan from Manchester City at Dutch side Cambuur, Byrne's self-belief was obvious. Since then, however, his path to the top has not run smoothly. After another loan spell at Blackburn Rovers, he headed for Wigan, Oldham - where the fans loved him but a bust-up with boss Frankie Bunn led to an acrimonious exit - and then Kilmarnock. Last December, it was announced Byrne was joining Shamrock Rovers, a real coup for the Hoops. His enormous ability has always been apparent; now the playmaker is on a mission to prove he has the discipline to consistently show it. Having excelled in front of McCarthy against Sligo Rovers - the manager described his display as "a masterclass" - he has been rewarded with a call. And Stevens has been impressed. "Jack just needed to go and play football," he said at Ireland's Abbotstown training base on Monday. "He was unfortunate at Oldham with how it ended because he was having a good season. He's got to build himself back up, play a lot of games. Everyone knows the quality that he has." Stevens knows what it's like to head for the bright lights of the Premier League only to be scalded by the harsh realities of what it takes to survive at the very top. It feels like the defender has been around for an age but he's still only 28, and arguably entering his prime. Currently playing a key role in Sheffield United's bid to earn promotion to the top flight, Stevens is fully realising the enormous potential he showed when shining in Shamrock Rovers' memorable run to the Europa League group stages back in 2011. His performances in high-profile games against Spurs, Rubin Kazan and PAOK were too good to ignore. Aston Villa came knocking and Stevens headed for England. He's since admitted that he wasn't ready for the move. The full-back's progress stalled as he toiled in the reserves and after loan spells at Notts County, Doncaster and Northampton Town, he bit the bullet and moved to Paul Cook's Portsmouth, then in League Two. It was a step back that ultimately enabled him make a considerable leap forward. Stevens flourished at Fratton Park, helping Pompey to promotion and earning a switch to Championship outfit Sheffield United in May 2017. A Republic of Ireland senior debut finally arrived - against the USA - and now he's flying with the Blades, who are second in the table with eight games to go. By the end of this campaign, Stevens could be a Premier League player again. This time, he will be ready. Older, wiser, and now a seasoned pro, Stevens has had to bide his time. It's why he can empathise with 22-year-old Byrne who has already illuminated Tallaght with his class. If he maintains this form over the next six months, Rovers will struggle to keep hold of him. "He has the hunger back, the desire," Stevens added. "He wants to do well, and hopefully he'll do the business [with Shamrock Rovers]. He's got the reward of a call-up and who knows, he might get himself back across to England. "Jack's a personality. The bigger occasion, the better he'll play. He thrives on being the best player on the pitch. He's got an arrogance about him, a swagger about him on the ball. He loves it."